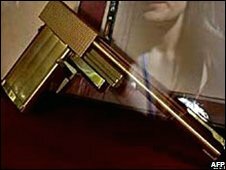 The £80,000 golden gun used in the 1974 James Bond film The Man With The Golden Gun has been stolen from studios in Hertfordshire. The gun was noticed to be missing from Elstree Studios on Friday. It was made for the film starring Sir Roger Moore and Christopher Lee. Lee plays Bond's nemesis Scaramanga, who kills using the gun made from a cigarette case, a lighter and a pen. The studios hope the golden gun will be offered to a memorabilia dealer. It is then hoped the thief will be able to be traced via the dealer. The gun was in the care of Elstree Props, a firm which is based at the studios. Staff have no idea when the gun was taken, but it was discovered missing on Friday. A spokeswoman for Hertfordshire Police said: "We were called to Elstree Studios in Borehamwood at 1325 BST after a report of a theft of a prop, which was the golden gun. In the film, when Bond receives a golden bullet inscribed with 007, he is distracted from his mission. He decides to track down Francisco Scaramanga, an assassin known as "The Man with the Golden Gun" whose assassinations cost $1m each. Scaramanga uses the golden gun to kill a number of his foes, before a final confrontation with Bond.